Desirable: (1) Experience in use of software programmes for data processing and statistical analysis. (2) Experience in projects or studies undertaken by academic institutions / government / public sector / quasigovernment organisations. Interested candidates may fill up the application form (word document) available NUALS website in soft copy format and e-mail as an attachment to cla@nuals.ac.in on or before 4 th June 2018.No other documents are to be send now.  The position notified is purely temporary and co-terminus with the duration of the study.  The engagement will not bestow any right whatsoever on the candidate to be considered for regular employment.  The person selected shall have no claim on the service of NUALS or the Government of Kerala.  Incomplete and defective application will be summarily rejected.  The date, time and venue of the interview will be intimated in due course by e-mail / mobile  The candidates will have to appear for the interview at their own cost.  The certificates need not be enclosed along with the application.  All certificates to prove age, qualification and experience shall be produced in original during the interview. The candidates shall also bring attested copies of the relevant certificates at the time of interview.  The University reserves the right not to select any candidate if it is of the opinion that none of the candidates is suitable for appointment.  No interim enquires will be entertained.  The selected candidate will be informed by e-mail or mobile phone. 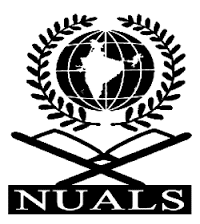 National University of Advanced Legal Studies (NUALS) recruits Computer Assistant / Data Entry Operator Posts. Post Graduate, Ph.d, Experienced candidates can apply.